Eduardo Bellomo, 30, from Verona, Italy was awarded a silver Drapers’ Company medal and is currently approaching the end of his PhD in Performance Psychology at the School of Sport, Health and Exercise Sciences. Eduardo completed an undergraduate degree at the University of Padua, Italy and came to Bangor to study his MSc in Sport Psychology. 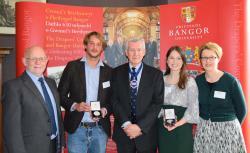 Aoife M Fitzpatrick, 24, from the Republic of Ireland, was awarded a bronze Drapers’ medal. Aoife is in the final stages of finishing her PhD in Cognitive Neuroscience at the School of Psychology.